It’s September and that means our favorite fruit-flavored consumer electronics company (that’s Apple, of course) rolls out the iPod lineup for the holiday season. 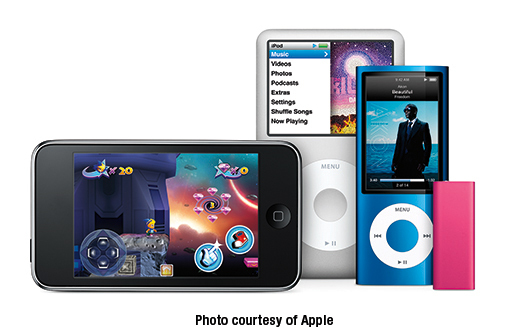 This year brought huge changes to the iPod nano, and more modest changes to the rest of the lineup — the iPod touch, iPod shuffle, and iPod classic. The video camera shoots in portrait and landscape modes and includes a tiny built-in microphone and speaker so it’s easy to show video to your friends on its new larger (than before) 2.2-inch color display. But wait — there’s more! The new iPod nano also has an FM radio that lets you pause live radio for up to 15 minutes; VoiceOver, which speaks the name of the song and artist; and a pedometer. The new iPod nano is available in 9 gorgeous colors and is priced at just $149 for an 8GB model or 16GB for $179. The new iPod touch looks the same as before but is up to 50% faster than the previous generation, includes OpenGL ES 2.0 support for smoother gaming, Voice Control to navigate your music by voice command, and Apple Earphones with Remote and Mic. It’s priced at $199 for 8GB, $299 for 32GB, and $399 for 64GB. The iPod shuffle retains its diminutive size and distinctive shape but is now available in a less expensive 2GB model for $59 or a 4GB model for $79. New colors include pink, blue, and green in addition to last year’s silver and black. Also new for the 2009 season is a 4GB special edition in bright, shiny polished stainless steel for $99. The iPod classic remains basically unchanged except that the previous model was 120GB for $249 and this year’s model is 160GB for the same price. As usual, this new crop of iPods offer more features but cost no more (or even less) than their predecessors and are available now at the online Apple Store (www.apple.com), Apple’s retail stores, and Apple Authorized Resellers.